The Hillside Public Library’s Off the Shelf Winter Newsletter is now online. Click on the “Winter Newsletter” in the sidebar to get the latest information on all of our exciting winter programs and events including the Friends of the Library Book, Bake, and Craft Sale, Afternoon Tea at Downton Abbey, and the Saturday Family Movie! 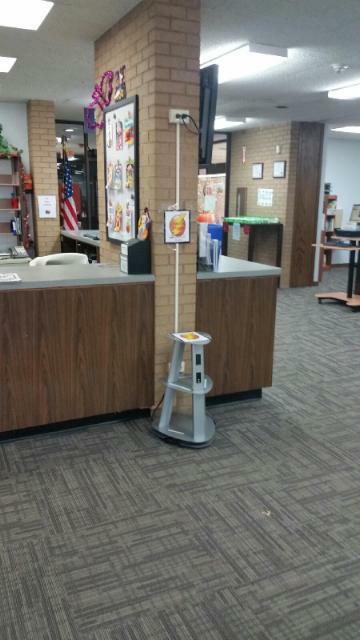 The Hillside Public Library is proud to introduce a new charging station for patron use. With this, you will no longer will you have to search around for an outlet to charge your phone of other mobile device. 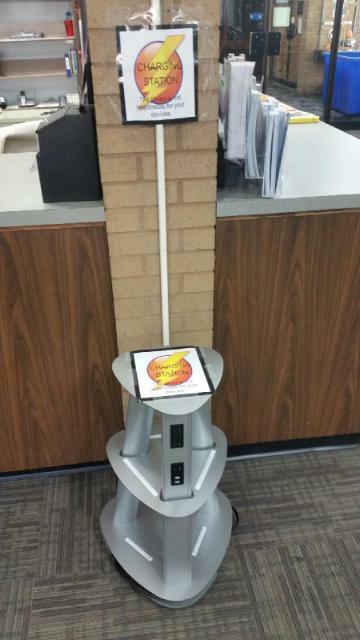 The station is located up at the circulation desk near the entrance to the library. 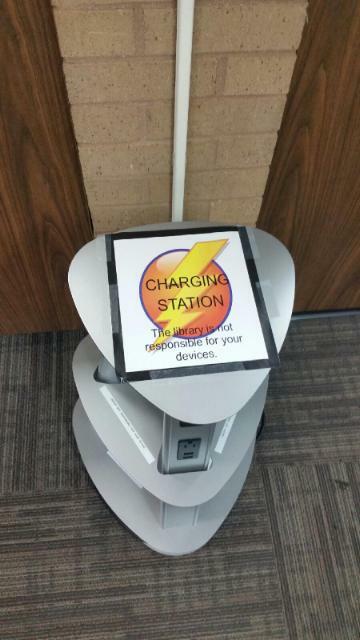 However, the library is not responsible for your devices, so remember to keep an eye on them while they are charging. The new materials for November 2015 have just been posted. Don’t forget to check out the catalog today for more details. It’s a great time to join the Friends of the Hillside Library! Your new membership will be good for the rest of 2015 and all of 2016! Members get to shop our huge book sale first at our special members only pre-sale! In honor of National Friends of the Library Week, join in person at one of the times listed below and you’ll receive a thank you gift! Monday and Tuesday, October 19 and 20 from noon to 4:00 pm. The goal of this course is to help keep older drivers independent, safe and confident while on the road. Caring for a pet may seem like a huge responsibility, and it is, but it is also a labor of love. This program will present basic information on caring for pets. It will also tell you what it is like to take responsibility for a Rescue animal. Dogs and cats from Magnificent Mutts will be present at this program. Program is suitable for ages 7 and over. Parents must attend with children under 16. Registration Required. Minimum 10. For many, having a Facebook account is now an expected part of being online, much like having your own email address. In this class you will obtain a Facebook account, learn to find friends, send messages, and post pictures. More if time permits. Registration Required. Min 3/Max 10. The new materials for October 2015 have just been posted. Don’t forget to check out the catalog today for more details. The Baby Boomers generation has a longer life expectancy than those of prior generations thanks to advances in healthcare. Unfortunately, living longer increases the likelihood of needing expensive long-term care, and the cost of care keeps rising. Sev Meneshian, CFP® a Certified Financial Planner™ will explain the different strategies that can be implemented to offset this major financial risk. Please register.